It would seem since GoDaddy acquired Host Europe for £1,500,000,000 (1.8 BILLION dollars) they are consolidating their brands, starting with DomainMonster. The list of companies under HEG (Host Europe Group) is considerable, it includes Webfusion, Domain Monster, Domain Box, 123-Reg, Heart Internet, Domain Factory and recently the Paragon Internet Group which includes hosting companies such as TSO Host, VidaHost and HostRoute, and a few more brands too. “We wanted to give you an update on the plans for DomainMonster since our last notification in April.”, it continues “As a customer of Domain Monster, you still retain your domains, products and services through Domain Monster, as well the login to your control panel and the ability to purchase additional domains.”. “We are, however, no longer accepting new customers to join Domain Monster. We are working on plans to migrate your products and services through to 123-reg, and will update you with further information as work moves forward.”. There is one line which really made me giggle, it almost clearly says you should expect the same crap services that the other customers of 123-Reg must endure. 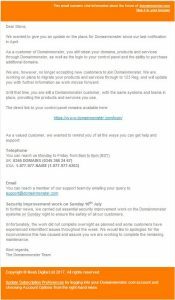 It continues “Until that time, you are still a DomainMonster customer, with the same systems and teams in place, providing the products and services you use.”. If ever there were a time to jump ship as a domain monster customer, NOW is that time. I have very strong views about 123-Reg, where I am happy to call them dishonest and inept, the long story cut short. I paid to register a considerable number of domains via 123-reg before I got my own Nominet tag. I paid my money, the domains was in my 123-reg control panel. I carried on registering dozens of names over a month or so. One day I found a buyer for one of my domains (A girls first name), I went to check the name and found despite it being in my control panel on 123-reg, it was registered to a different 123-reg customer a few days after I registered it. I checked my invoices, I had paid for it, and it had been added to my control, but 1 or 2 days later someone else had registered the same domain with 123-reg. 123-Reg tried to blame is on me, saying my address details were incorrect, but I pointed out I had 100+ domains using the same details and they were ok. They tried to blame Nominet who refuted it and said my details were acceptable, so they basically just lied repeatedly to cover up the fact they screwed up. At the time there were loads of people talking about delays in registration and names not being registered at all with 123-reg but they never acknowledged it. I went through my domains, and found roughly 5-10% of those I had paid for and registered were either unregistered or had been registered to someone else at a later date and 123-reg never fully refunded me.